This is a single sealed, shallow mount enclosure that is made of hardwood medium density fibreboard. It can house a 12-inch subwoofer. It lives up to the reputation of Atrend for coming out with high-quality car audio equipment and accessories. This box is specifically designed and engineered to maximize the sound quality of specific subwoofers. It is also intended to enable subs to perform well even when placed in tight spaces. It has a carpeted finish that gives it a premium look and feels. Attend backs it up with a one-year limited warranty. This shallow mount subwoofer enclosure is made from ¾ inch medium density fibreboard. This is the same material that is being used in other more expensive enclosures. MDF is highly recommended as a speaker enclosure material because it can damp out unwanted energy and vibration. With the MDF construction of this enclosure, all you can get from your sub is great sound. With its shallow mount design, this enclosure should fit easily under the seats of compact cars. It can also be placed at the back of the seats of cars, trucks, and mini SUVs. Because of its design, installation of this enclosure is also easy especially for handymen. It can also be easily removed and transported out of the vehicle. 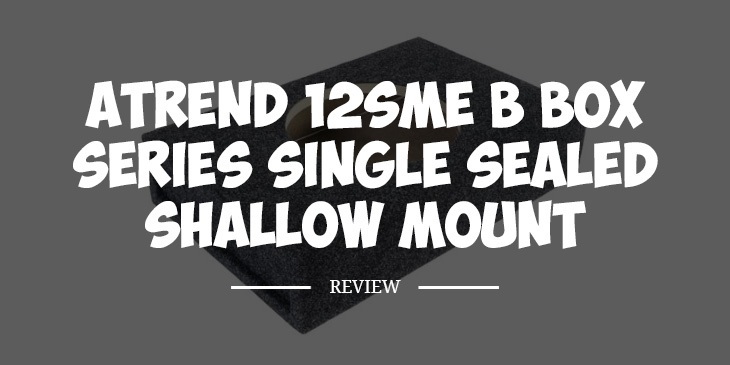 The black carpet of this shallow mount subwoofer enclosure not only gives it a premium look. It also protects the sub by preventing the unit from sliding around. The carpet is firmly glued, with most Amazon.com reviewers saying they are satisfied with the way it was attached to the box. The terminal is found at the back instead of being at the sides. The terminal isn’t of the best quality but most reviewers on Amazon.com found it to be serviceable. This enclosure should be able to house some top rated subwoofers like the Pioneer TS-SW3001S4, MTX TT6512-01, Alpine SWR-T12, Boss Audio NX10FD, and RE Audio SL-12. You can also put the Pyle 12” inch subwoofers and Soundstream Stealth-13 on this enclosure. Q. What is the mounting depth of the enclosure? A. Its top depth measures 5.25 inches and its bottom depth is 8.5 inches. Q. Does it come with wires? A. No, you have to supply these. Q. Would it fit under the car seats of SUVs? A. It would depend on the type of SUV you have. But it is designed more for mounting at the back of the seats. This shallow subwoofer enclosure could be what you need to improve the sound quality of your car audio system. Pairing it with the right subwoofer can enhance the bass level and make you feel every low beat coming from the speakers. This enclosure is of a shallow mount design hence you don’t need to have a lot of space in your car or SUV to install it. Plus, it is affordable and made of high quality MDF. It’s a subwoofer enclosure I can highly recommend.